As my self-inflicted rules say that I’m not allowed to count 2 races in the same town towards the “80”, I’m annoyingly not able to tick another one off with this run. Which is a bugger because I ran really quickly this weekend! With that in mind, I’m not going to write much about it and will let Pippa, who ran her first half marathon, do the talking! 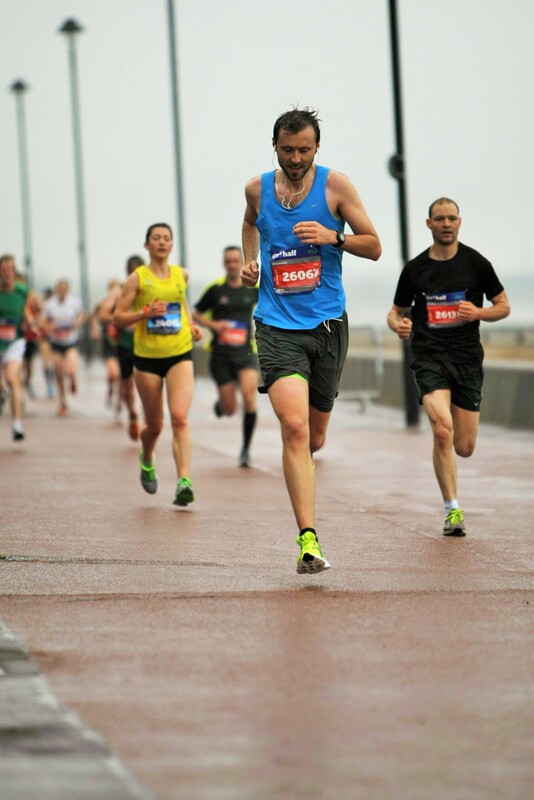 Speed: Fast, with 10k reached in 38.51 (two PBs in one race!). Top 1% overall. 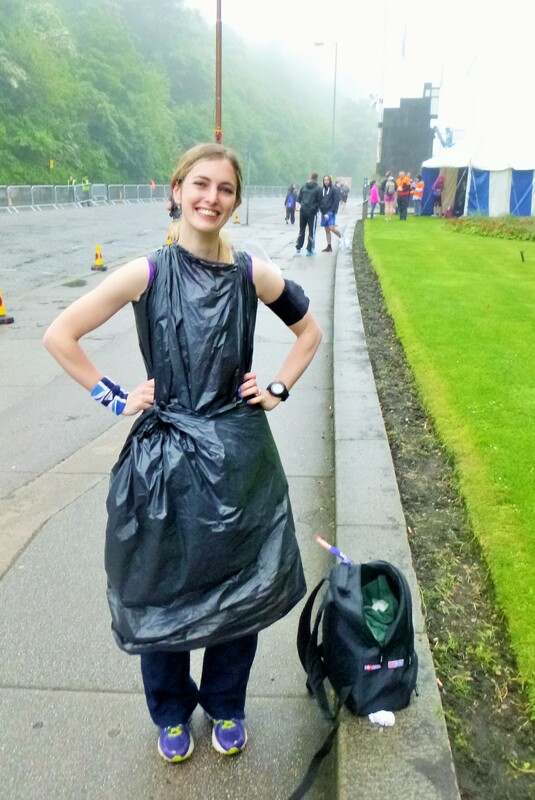 My first half marathon was getting off to a great start when the heavens opened about 15mins before the start… lovely Scottish weather… What I didn’t realise was that the starters had to wait for the London Road start to be cleared (all the fast people) before they could set us off, so in order to warm up properly, I’d stripped my bin bags off way too early – one about 30 mins before the start (so I could actually jog without waddling) and the other 5 mins before we were supposed to start, so I ended up getting pretty chilly and wet for 15mins – d’oh! 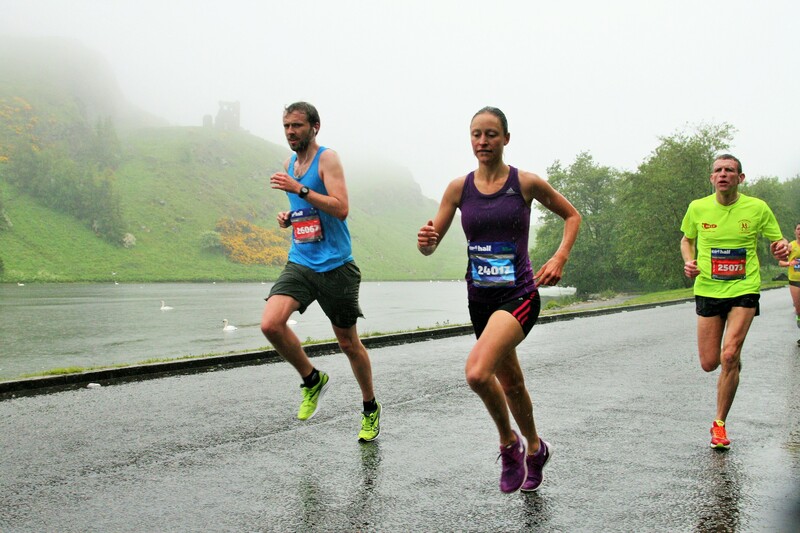 I’ve been reading a lot about running long distance races (to help prepare myself properly/freak myself out) and I was a bit worried to go fast at the start (as they warn you not to set off too quickly in every article) but it was downhill so I decided that as long as I wasn’t pushing too hard it was ok to go fast at the beginning and let gravity do some of the work and maybe gain a bit of time that I would need at the end of the race to meet my target. I managed to keep going relatively fast (5:30/km) up until I hit the wind on the seafront (at Seafield/Portobello) where it’s really exposed and it was really quite miserable. Luckily for me, I knew some of the marshals who were stationed along the seafront and it was really nice to see their smiling faces cheering everyone on and their recognition when they saw me – it really helped me to keep going and gave me a bit of extra energy too (plus I tucked into some of the Jelly Babies along the way that I had stashed in my arm pouch)! The two way section went on for ages – I kept thinking where’s the turning point, where’s the turning point, it must be soon…! It wasn’t… it just kept going and going… However, one benefit of the two way bit was it meant I got to see a few people I knew along the way a few faster (work colleagues and a Korfball friend of Simon’s) and a few who started behind me but were roughly the same speed. It was nice to see that they were doing well too (although I’m silly and competitive so part of me wanted to catch the fast people up even though I knew there was no chance). 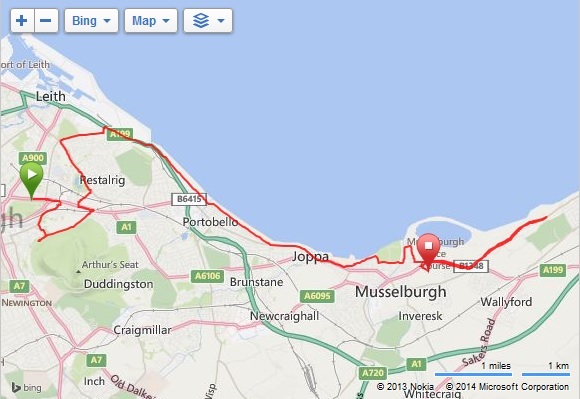 Once I got to the end of the two way bit, I knew it wasn’t too far to go but it was agony trying to keep myself running. I kept telling myself just keep running (in a Dory voice from Finding Nemo). By the time I got to the people lining the road, I managed to speed up a little (back to normal pace or Simon’s slow walking pace) and I managed to spot Simon standing on one of the barriers to get up high. I was waving to him but he didn’t see me for ages, although luckily he still managed to get a good photo (yay!)! I managed to “sprint” across the line and was ecstatic to finish! 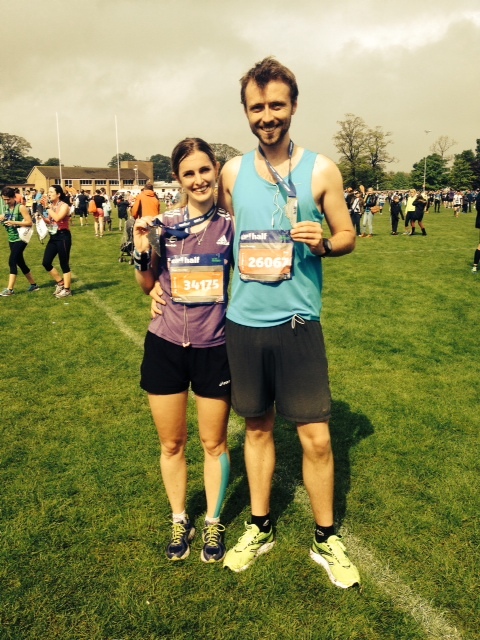 Finishing thoughts were thank god that’s over – why did I sign up for another one in two weeks’ time? I must be mad. I hurt a lot. Can I sit down now please? No… oh I have to go through a get my medal (that could be used as a weapon) and water – oooh blessed water that isn’t slopping out of the bottle as I run! 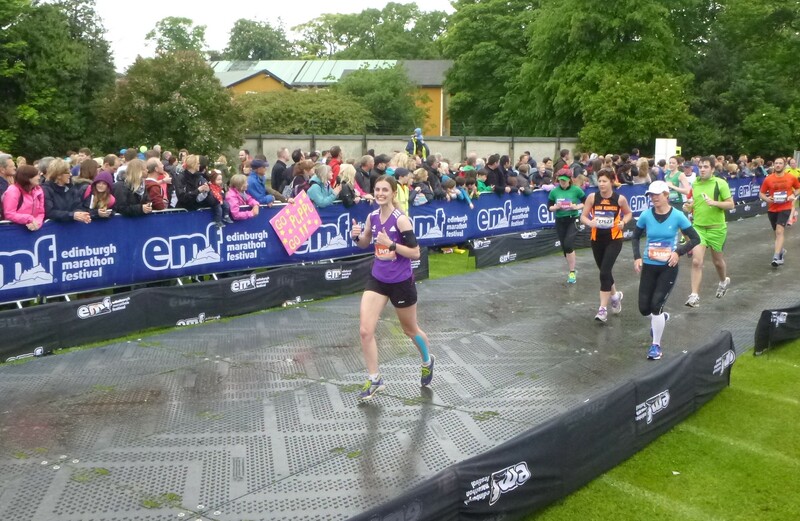 The lovely EMF website has a funny video of everyone crossing the finish line, I literally get to the finish line sprinting and stop and start walking like a robot, knowing that I need to get out of other people’s way! korfball??? I’ll have to look that one up!